Elderly people - can you afford NOT to help them? 20-step program heals up to 8 emotions in one session - SCREEN Therapy! The earlier unwanted emotions are healed, the more health improves. Buy now from Smashwords under the "Pay What You Want" scheme. 2. Trigger genetically inherited heart, cancer or other health problems. Allan Sweeney based SCREEN on a psychiatrist’s teachings, and successfully taught/used it globally. helped by a medical dr Allan Sweeney suggests ways to alleviate suffering and improve quality of life. 1. Years of therapy not needed! 3. Patients don’t need to describe their traumas to others! Sit quietly. Think of a situation from your past, that still causes bad emotions, feelings or thoughts today. Then read and do 20 points one by one to heal up to 8 emotions in one session! 3. R epeatable – tell friends and family – this may help them too! 6. C heap – free or by donation therapy with high success rates – you’re onto a winner! 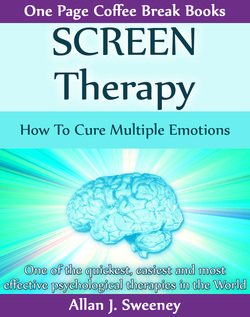 if you find SCREEN is one of the best psychological therapies in the world. Aim to offer effective help, in less reading time. Quality knowledge is condensed, with no padding or ‘waffle’. Golden nuggets help you and your friends.